I use ‘jogging’ because ‘mountain running’ sounds a bit pretentious when used to describe the shuffling and brisk walking I’ve been doing. 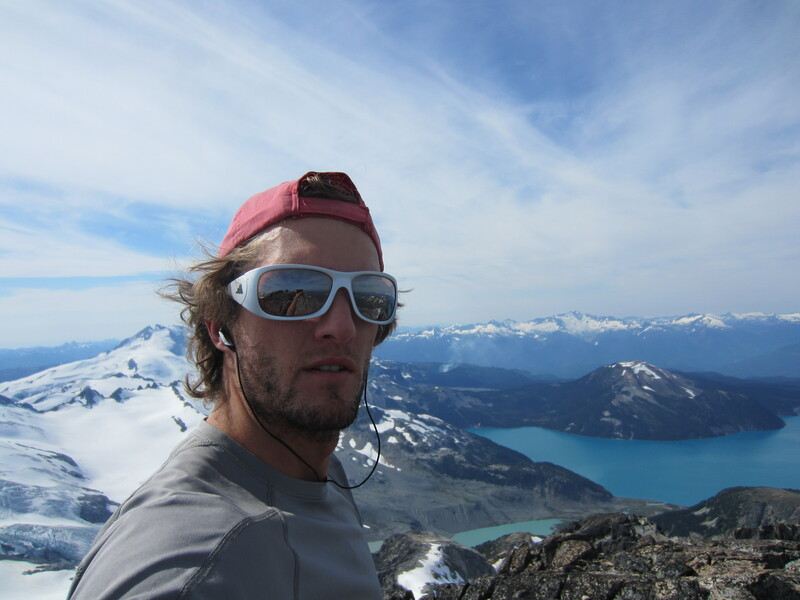 On the summit of Castle Towers with Garibaldi Lake below. I was 4:03 to the main summit and 6:54 car-to-car. 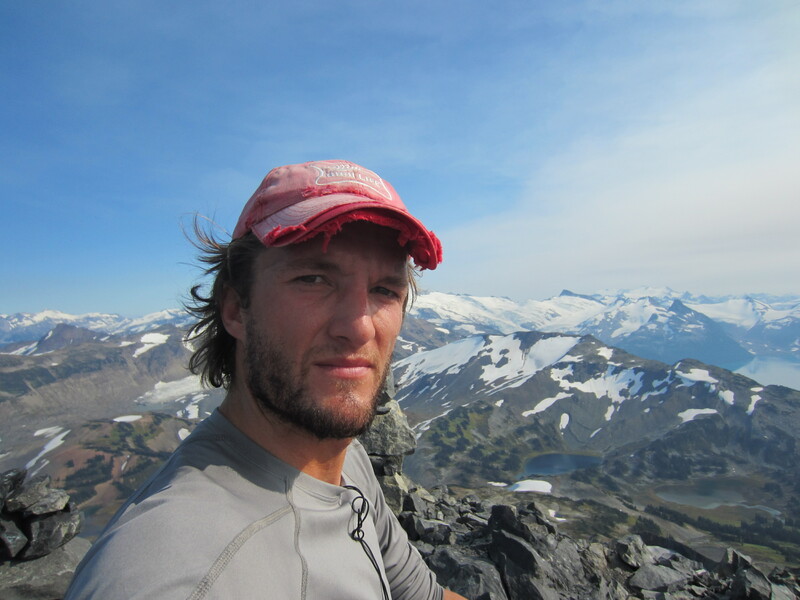 When I returned from Alaska, my desire to climb serious alpine routes was at a bit of a low. 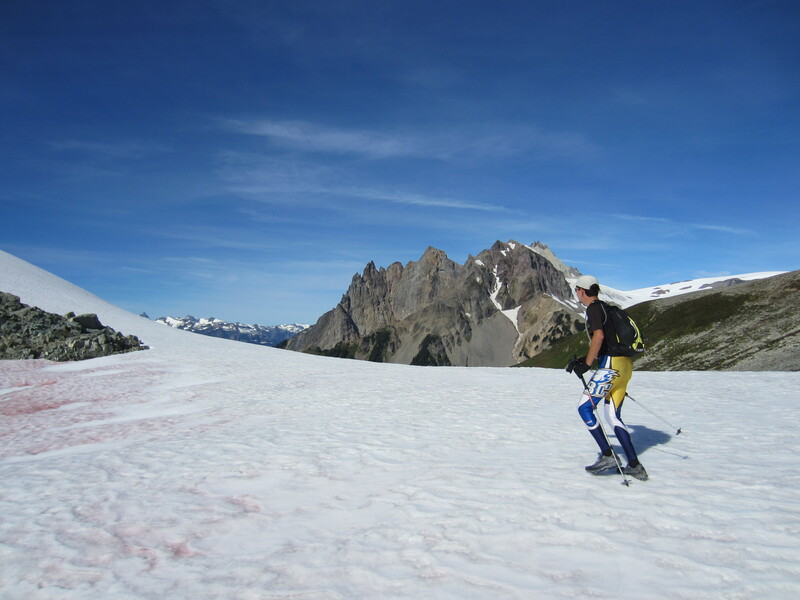 I’ve always tended to waver (as the name of this blog suggests) in my assessment of whether the rewards justify the risks, and for a large part of the summer I simply felt more motivated to eat ice cream, drink beer, and top-rope than I did to scare myself in the mountains. If this sounds as if I’m on my way to becoming completely soft, I’d like to reassure you that this is not the case. All I have to do is think of my numerous ex-climbing partners who have changed hobbies to things like jogging, mountain biking and yoga, to get an idea of what my life would look like if it were completely devoid of adventure. And thankfully fear is a powerful motivator. Eric jogging along the ridge between Brandywine Mtn. and Mt. Fee. Pyroclastic Peak and the Vulcan’s Thumb (the pinnacle on the left and unclimbed!) are in the background. Being an intrinsically lazy person, the ice cream, beer and top-rope lifestyle ought to have been enough to occupy me while waiting for my motivation for serious climbing to resurface. However, a few factors conspired to rekindle my interest in distance running. There are very few things I enjoy more than rock climbing, and since I live in one of the best climbing areas anywhere, I tend to do quite a bit of it. You couldn’t climb as much as I do and not be somewhat skilled: this summer, after months without climbing, it didn’t take me too long to get back to climbing 5.12 on gear. This, I think, qualifies me as a competent rock climber but little more; and it’s competency achieved through years of practice rather than any particular natural talent. There’s a particular dignity in doing what you love regardless of how good you are at it; but sometimes it’s nice to focus on your strengths. And my strengths are things like endurance and pain-tolerance rather than say agility and power. More jogging (and likely only for the benefit of the camera) on the traverse from Brandywine to Cypress. Not surprisingly, I got a pretty bad sunburn on my upper thighs. We were 5:36 from trailhead to trailhead. Eric Carter photo. The London Olympics, and in particular Cam Levins, were another source of inspiration. Cam grew up a few kilometres down the road from where I did on Vancouver Island. He’s five years younger than I am, but comparing times, he wasn’t all that much faster in high school than I was. He went to a semi-obscure college in Utah where he developed into one of the best distance runners in North America. As far as I can tell, the secret to his success is simply hard work and dedication: he runs 150 miles a week. While I’m not delusional enough to think that I could ever run at anywhere near his level, it was still motivating to see such a normal-looking guy from practically next-door competing with the best in the world in London. Stefan eating fuzzy peaches at Crown Pass during a circuit up and around Hanes Valley. Having spent the summer running sporadically in the mountains at a leisurely pace, I thought that I was likely the next Kilian Jornet and should probably enter a race. The Rubble Creek Classic seemed like as good an event as any to resume my competitive running career after a seven year hiatus. For the first kilometre or so, I felt like my old running self (the trail was essentially flat). Unfortunately, after crossing the Cheakamus River, the course began to climb, and continued to do so for more than 1000M of elevation gain. It didn’t take long for me to realize that perhaps my fitness was not quite as top-notch as I had assumed. My legs filled with lactic acid and I faded to fifth place as those around me ran where I was forced to walk. Thankfully, the grade of ascent eventually slackened and although my legs were heavy and tight, I was able to avoid a complete meltdown. Upon beginning the descent from the high-point of the course, I was relieved to find that the uphill muscles in my legs (which by this point were barely functional) were not required to run downhill. I was also relieved to find that my ice cream and beer diet was now working in my favour: my substantial upper body mass (at least relative to say a Kenyan marathoner) was resulting in good momentum which at the very least helped to scatter the groups of hikers on the trail who might otherwise have been in my way. Brad and Eric, both fit and skinny ski-mountaineering racers who had made me suffer on the climb, came back to me over the course of the 10km, 1300M descent. 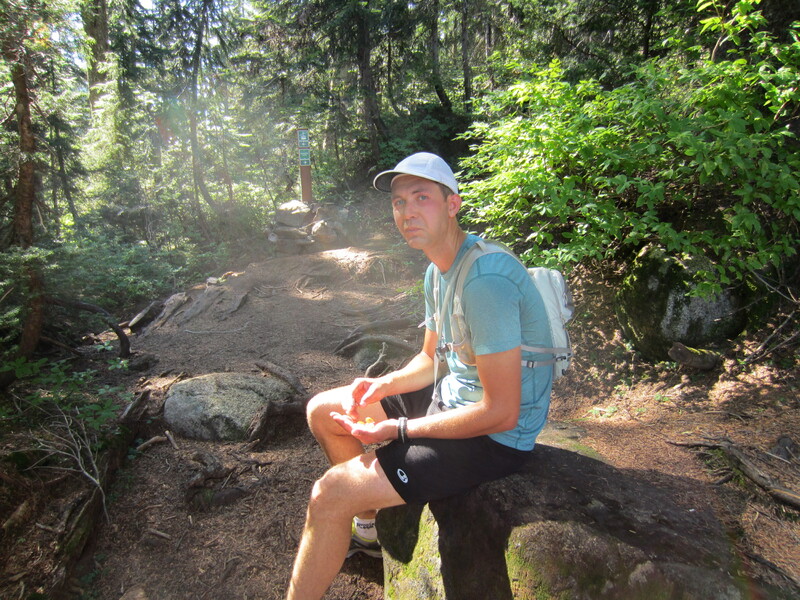 However, there was no catching Ed who, fresh from representing Canada at the World Mountain Running Championships, broke the course record by a whopping six minutes. Nonetheless, finishing in second place, with a time just over two hours for the 24km race is nothing to scoff at, even if it wasn’t accomplished in the style I might have hoped for. Perhaps, contrary to what I swore to myself while walking an embarrassingly low-angled incline in the middle of the race, my running career isn’t quite over yet. A horribly unflaterring self-portrait on the tourist summit of the Black Tusk. I’m clearly in desperate need of a shave, a haircut, and a new hat. I was 1:59 to the summit via Rubble Creek and 3:14 car-to-car. 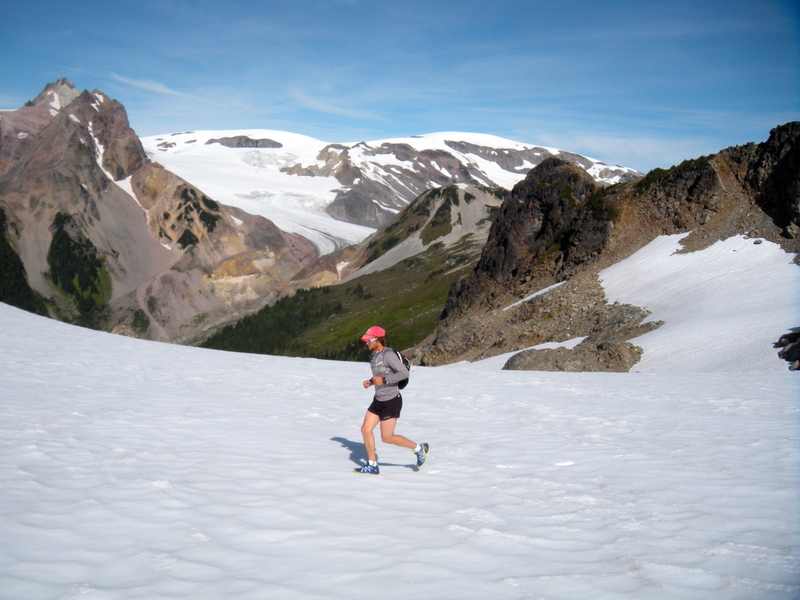 I apologize for obnoxiously including the times from my casual training runs in these captions; my thinking is that they might provide some ideas and a starting point for genuinely good mountain runners who want to run ‘fastest known times’ in the Sea-to-Sky corridor.